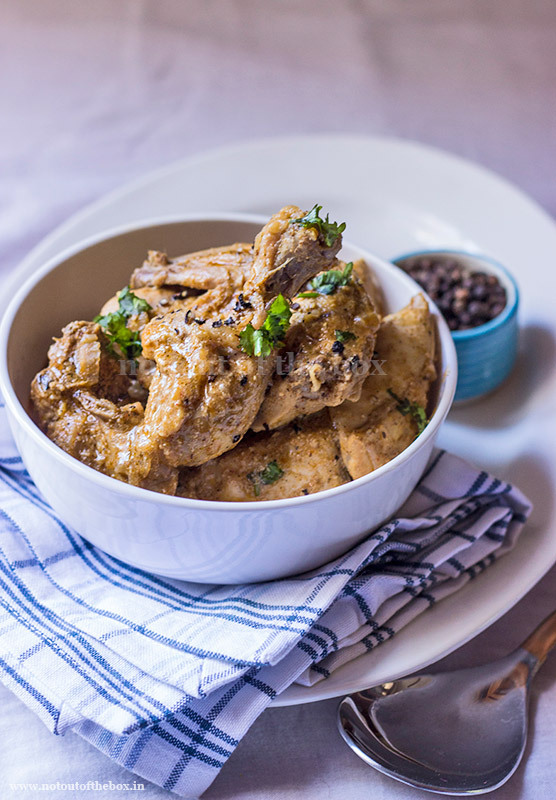 Marinate the freshly washed chicken pieces with whisked yogurt and ginger-garlic paste. Keep aside for 1 hour. In a frying pan dry fry kasuri methi over medium heat for a few seconds. Grind into a fine powder using your mortar pestle. Keep aside. Heat oil in a deep frying pan/kadai (non-stick preferably). Temper with the ingredients mentioned ‘for tempering’. Add sliced onions, sauté over medium heat until light brown in color. Now add marinated chicken, green chilies, coriander powder and kashmiri mirch powder. Mix well. Cover and cook on low heat. Keep stirring in between. When the chicken is half cooked, add salt and powdered cashew nuts. Mix, cover and cook until the chicken is fully done. Don’t forget to stir in between. Add kasuri methi powder, garam masala powder, and chopped coriander leaves. Mix well and remove from the heat. Serve hot with Naan, Paratha or Pulao. I’ve not added any water while making this curry. The consistency of this curry was medium thick. 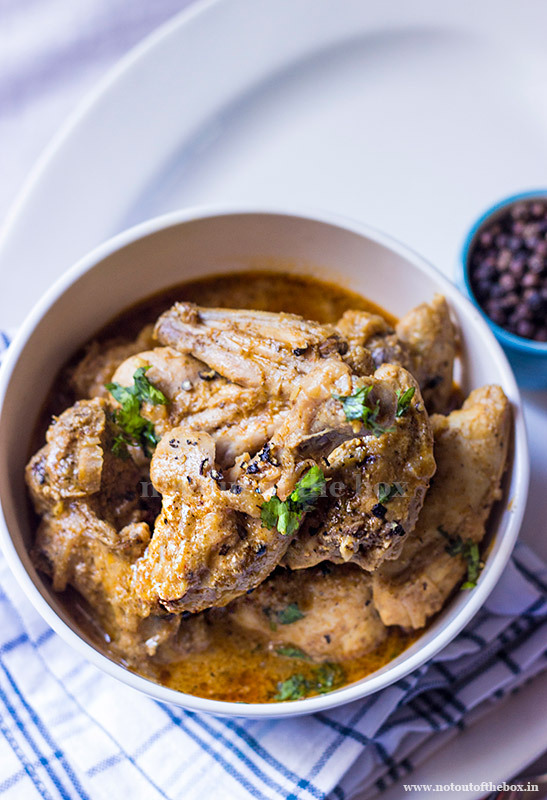 Hey Chandrima..just stumbled upon your blog and totally loved your pictures.Totally drooling over this kali mirch chicken..will be cooking it soon. Hi Chandrima! loved it just only one thing I would like to know, what kind of chicken to be used? Leg piece or boneless? Hi Kaustav! I hope you’ve cooked the chicken already. 🙂 With bone or boneless anything will go for this recipe. Happy Cooking! You say above that with bones or boneless is fine. But wont the cooking times change with boneless? I was thinking of using boneless chicken thigh meat. What do you think? As per your understanding always lesser cooking time while using boneless chicken for any dish.